A slingshot is a relatively cheap, lightweight weapon used for hunting and target practice. Sometimes called a shanghai, flip, bean shooter or catapult, it's a hand-powered projectile weapon based on a Y-shaped frame with two rubber strips attached to the uprights. The design dates back to the 19th Century and crosses multiple cultural borders. 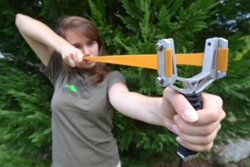 The slingshots available from Preppers Shop UK are excellent for the UK Prepper, whether for target practice or hunting. In the right hands a slingshot can be an affective hunting weapon. We sell a range of different styles, as well as spare elastic and targets.